This cookbook season, I've been lucky enough to be involved in the Abrams Dinner Party, which is a clever way of saying that I get a whole lot of cookbooks for free. Some of them, I was drooling over. Some, I'd never heard of, and probably would not have taken a second look at. But that's fine, because some of the ones that I wasn't originally fond of turned out to be pretty good. 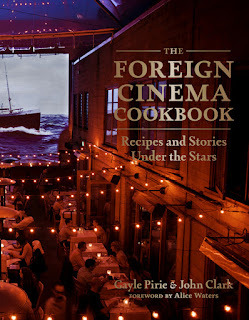 One of the most recent books to arrive was The Foreign Cinema Cookbook by Gayle Pirie and John Clark. The subtitle of this one is Recipes and Stories under the stars. I'll have to admit that this one wasn't on my radar at all. I didn't know the authors, and even if I had seen it in passing, I probably would have passed, since I know very little about foreign films. Turns out I was a bit wrong in my assumptions. Foreign Cinema is the name of a restaurant in San Francisco. Oopsie. So, instead of finding recipes dedicated to movies I'd never seen or recipes by stars I never heard of, this is a book full of recipes from the restaurant. There's everything from Strawberry Bourbon to Crab Cakes with a Curiously Scented Butter Sauce (I just love that name!) to Creme Fraiche ice cream. Like a lot of cookbooks written by folks near a coast, there are quite a few recipes featuring fresh fish that isn't available to us folks in the middle-ish of the country. And like many cookbooks based on restaurants, there are ingredients you might not find at your local grocer. But that's okay. It's a big book ... and heavy - did I mention that it's heavy? ... so there are plenty of recipes to choose from that can be made with common ingredients. And of course you can substitute. If you don't have that fresh fish available in your market, you can always pick up the bag of frozen white-looking fish from the freezer bin and make sure that the rest of the recipe is done right. Even if you skip past the full recipes, this book has a pretty darned good selection of extra things that you'll find very handy. There are spice blends, condiments and pickles, sauces, vinaigrettes, and some simple things like stocks breadcrumbs, and other things that can dress up an otherwise plain dish. Photos in this book are pretty, yet achievable. The ones on baking pans or in pots certainly are what you should see, but even the plated dishes look doable - if you choose to do them that way. And, I have to say, I really appreciate that. It irks me to no end when I see a recipe that calls for (for example) avocados to be mixed into a salad and the accompanying photo has pristine cubes of avocado. I mean seriously, either that avocado is rock-hard and not pleasant to eat, or the photographer cut it and placed it into position without mixing it in, as the recipe says you're supposed to. Yes, it's a pretty photo. But no, that's not what it's going to look like when served. And sometimes that matters. Like when the inlaws are coming over. But ... I digress. 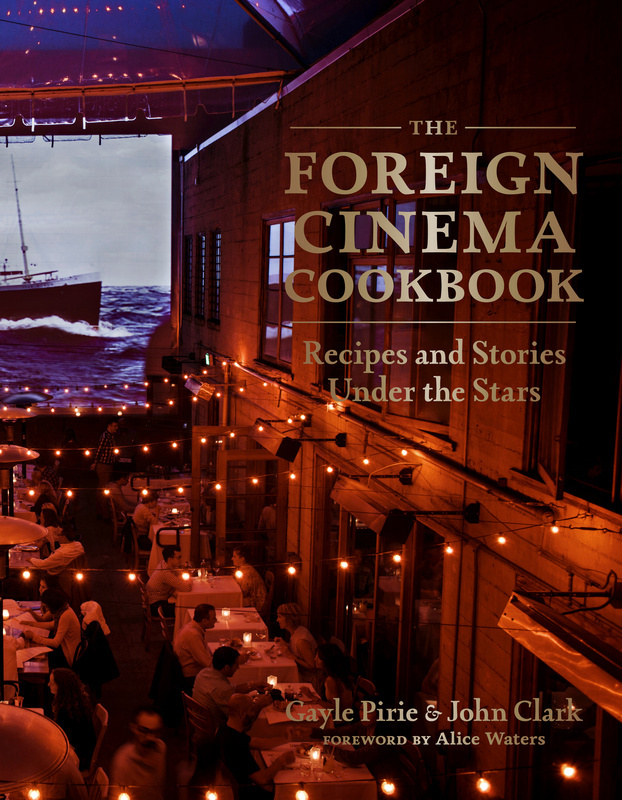 The Foreign Cinema Cookbook is not a book of foreign recipes, folks. It's from a restaurant right over there in California, making American-ish food. In case you missed it up top, I got this book for free. Gratis. Nada cost.